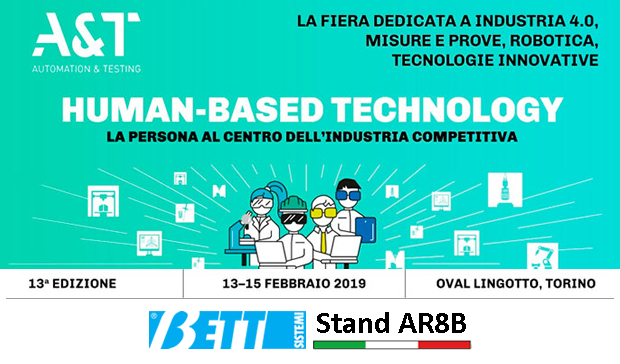 From 13 to 15 February, Bett Sistemi will be exhibiting at the "A & T - Automation & Testing" Fair in Turin, the trade fair dedicated to Industry 4.0, measurements and tests, robotics and innovative technologies. On the occasion of A&T at the AR8B Booth will be presented all the big news of Bett Sistemi's B-Flex range entirely dedicated to conveyor belts. In collaboration with the Zone Agent, the Longo Rappresentanze company, Bett Sistemi, as by tradition, will present a booth rich in ideas for Industry 4.0 conceived for B2B, such as the components for synchronous belts and the new WC63 hygienic transport systems of the Cat.3 Series W, which are innovating manufacturing processes in companies around the world. The technical and commercial staff of Bett Sistemi will be available to evaluate the best solution for your production sector. Come and visit us ... do not miss it!